Click the button below to add the Ducati Hi-Flo Race Oil Filter suits 600 Pantah - Includes Postage to your wish list. "An oil change is cheaper than an Engine rebuild"
Hiflofiltro are the only TÜV certified oil filters, ensuring the highest levels of quality, performance, and vehicle warranty compatibility. 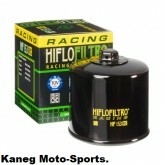 Hiflofiltro RC is the ultimate performance oil filter.